The keratin reconstructs hair, nourishes and restores the shine eliminating the frizziness and the keratin treatment is a procedure for reconstruction of hair. Also well-known as anti-frizz smoothing keratin treatment it is one of the most sought after in hair salons because, besides nourishing it returns the softness and shine to the hair and eliminates the frizz. Application process is simple, but must be done by a professional and normally takes 1.30 – 3 hours to be finished. Normally the effect lasts for 3-5 months depending on the brand of the product and the condition of each hair. The treatment is suitable for all hair types and is very efficient in damaged or thick hair. Before starting this procedure a professional must evaluate the hair condition to make appropriate use of a keratin product. Hairs’ density, strength, curls, perms, dye, bleach, previous chemical treatments performed are evaluated before starting the procedure. Wait two weeks after any treatment with chemicals before making the keratin treatment. Do not trim your hair before applying the treatment; it should be done after it to prevent split ends. This treatment is not recommended when pregnant or in the period of breast-feeding. 1. Washing. Hair is washed with a special shampoo making a thorough cleaning of the hair cuticle, peeling waste and impurities adhered and opening the hair cuticle for optimum reception of the keratin product. The shampoo stays for 5-10 minutes and it’s rinsed with water. It is advisable to wash your hair twice in order to remove any residues from the hair and the roots, but it also depends on the type of hair and system that is used. Hair is dried with hairdryer until it’s totally dry. 2. Application. 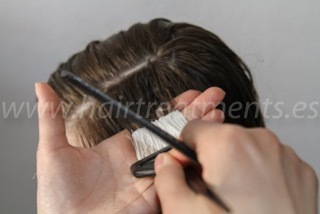 The keratin treatment procedure is followed by application of a keratin product using protective gloves and a brush. Hair is divided into four parts and the product is applied using a stirrer, starting from the nape and avoiding contact with skin. It has to be done strand by strand without touching the scalp and the strands must be combed carefully making sure that there is no excess or lack of product. Depending on the system that is used the product has to be left on hair for certain time or dried immediately. 3. Drying. 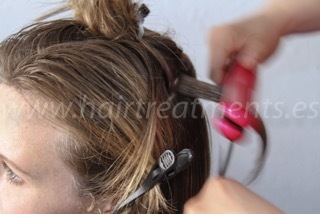 Hair is carefully dried removing excess product and using a brush. Starting from the back to the sides and the front its finished until the hair is completely dry. 4. Ironing. Specialists recommend usage of irons with titanium coverage and reducible temperature which can be adjusted depending on hair type. If hair is fine, bleached or very harmed the ideal temperature would be between 180°C and 210°C and a flat iron must be passed 5-7 times per strand. For virgin or curly hair the ideal temperature would be between 220°C and 235°C and a flat iron must be passed through each strand from 10 to 12 times for a better result. 5. Finish of the keratin treatment procedure and after care. Depending on the keratin treatment procedure and system used hair has been rinsed with water, nourished with a special mask and blow-dried as usual. Some systems require not to wash the hair at least until after 24 hours of treatment, although it is best to wait 72 hours and in case of any unforeseen circumstances hair has been wet before 24 hours, it must be immediately dried with a hairdryer and the iron must be passed slightly to medium or low temperature. Again depending on the keratin treatment procedure and products used some systems require no usage of clips or rubber bands on hair at least for four days in order to avoid pressure and unwanted marks. Some brands have after care products like shampoos that do not contain salt for maintaining the maximum result for a longer period. With newest technologies and products there are keratin treatments that do not require the usage of after care products and are very harmless to the client’s health. The results from keratin treatments are immediate and the treatment must be repeated every four months or as needed. This entry was posted in Keratine, treatment by Aneta. Bookmark the permalink.